Jeff For Banks: Are the regulators getting you down? These past two years have often been extremely difficult. As consultants, we should try not to personalize engagements. But I can’t change the internal wiring. 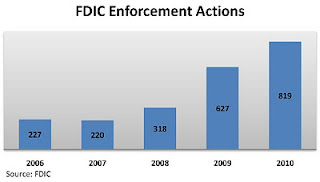 Last year, a client failed, and many more received regulatory orders. Memorandums of Understanding (“MOU”), Formal Agreements (“FA”), and Cease and Desist Orders (“C&D”) have been on top of our reading list for the past two years. The stark increase in such orders has been alarming. 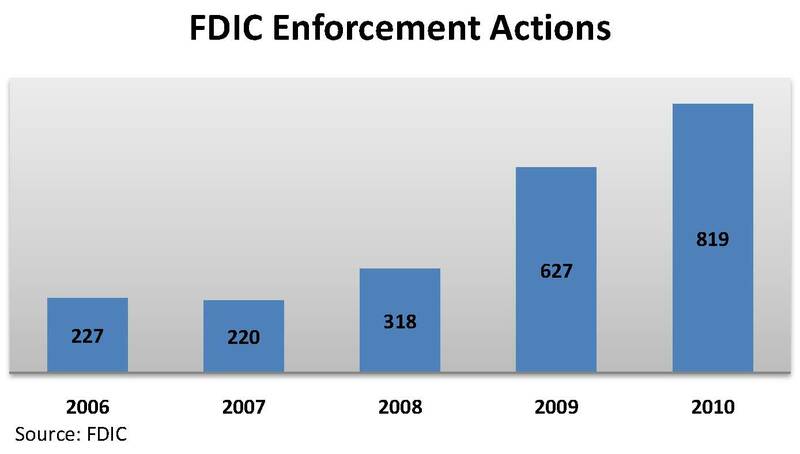 The FDIC has nearly quadrupled its enforcement actions (“EA”) over the past three years. So what, right? The OCC cut and paste because they wanted a similar strategic plan from both institutions. People and organizations do this all of the time. The difference here is that SCNB has been profitable throughout the crisis, and achieved a 1.12% ROA for the third quarter 2010. Bay National failed on July 9th. In this context, is similar treatment in an EA fair? I would vote no. There are many Articles in EAs, and the strategic planning article in the above institutions is one of many. But life, and business, is not necessarily fair. I’m not sure the lesson we should glean from the similarity of these two orders should be about fairness. The productive view about the similarity of EAs is why haven’t we been doing some of the things required by regulators in the first place? Why do many, if not most of these orders contain Articles relating to strategic and capital plans? Banking is a highly regulated industry, and has been since the Great Depression. Regulators must approve our initial business plans, capital plans, and various other operating procedures prior to granting a charter. Once granted, regulators examine us at least annually, and frequently more often, to ensure we are complying with the myriads of laws and regulations designed to promote safety and soundness. They used to approve interest rates and limit products. Given the highly regulated environment, bankers are kept in a tight box of things they can and can’t do. So why develop a strategy? Budgets have successfully served as strategy the past three generations, haven’t they? In the context of EAs, I don’t believe regulators are compelling bankers to develop strategic plans to identify a competitive advantage, to differentiate from other banks, or to build a roadmap to the future. When we read between the lines of EAs, we see regulators looking to tighten the box, remove gray areas, and exert greater control by requiring banks to seek permission to deviate from the plan. But that should not stop those operating under EAs from taking maximum advantage of the consulting and advisory dollars they are required to spend. If required to develop a strategic plan, why don’t banks assess the competitive environment and build a vision and plan for their sustainable future? Similarly and almost complementary, the capital plan should be a component of bank strategy. How much capital will the bank need to execute the plan? What are the preferred and secondary sources of capital? Imagine a bank that seeks to grow organically by positioning itself as a small business expert within its communities. This will drive products, risk appetite, credit decisions, strategic alliances, training, and capital requirements, to name a few. Perhaps the bank would like to pay higher than market dividend yields because their investor base enjoys dividends. So growth can only be partly funded by retained earnings. Planning for this, perhaps the bank can establish dividend re-investment plans and employee stock ownership plans to enhance capital. In this context, the bank decides what it wants to be, and sets strategy to accomplish it. We don’t need the OCC to tell us that! A third Article that is oft repeated in EAs is a management study, requiring the bank to hire a consultant to evaluate the board, senior management, and/or staffing levels. Strategic plans, capital plans, and management studies are my firm's top three regulatory-mandated engagements over the past two years. So if these appear in your EA, fear not. They are appearing in many. Similar to strategic and capital plans, why not take advantage of the required management study expenditure to determine if you have the right team in place to execute your strategy and succeed into the future? I understand that management studies are not particularly comfortable. But, since you are required to undertake one, why not make it as beneficial to the future of your bank as it can be? You have a good idea what team members might be holding you down. Chances are the outside advisors will discover it too, and perhaps find some diamonds in the rough! The level of regulatory activism is greater today than at any other time in the past 20 years. The political climate is exasperating the situation and creating uncertainty. Amidst our efforts to avoid or get out of enforcement actions, perhaps we should take advantage of the required introspection to determine a strategy that improves our competitive position and sustains our future. I would like to read your thoughts on the regulatory environment.